If you’re a business owner or entrepreneur, odds are you’re overworked. It’s not easy being the head honcho. One of the biggest obstacles that any owner or manager needs to overcome determining how to go about delegating tasks and responsibilities. Second to that, is recruiting talented employees. When building your dream team, it is paramount that you get it right the first time. It’s time to grow your team, and that’s a good thing, it means your business is growing! The bad thing, though, is the fact that recruitment is tough. There are likely a lot of other owners and hiring managers at competing companies who are attempting to bring on additional team members as well. In today’s tight labor market, businesses are hiring at a furious pace. And as your competition battles for top talent in this candidate-short market, it’s critical you become a hunter, not a gatherer. Gatherers rely on antiquated methods of discovery. They have an ‘if you build it they will come’ ethos – they post an ad on online, and then sit back hoping that top talent finds them. Hunters, on the other hand, are proactive and calculated. They take a multifaceted approach to recruiting talent by using a plethora of tools and channels to attract the best candidates. Those resources include internal referrals, cutting-edge technology, outsourcing to virtual assistant firms, carefully cultivated professional networks, and more. The truth is, that the days of simply posting a job and receiving decent resumes are gone. As we move further into this dynamic job market, employers must remain agile, and continue to seek ‘out of the box’ solutions. We’re in a vastly different job market; and candidates oftentimes have the advantage. Companies large and small often spend a lot of time selling candidates on how awesome their culture is, only for these new hires to experience a different (and not as epic) culture once they’re onboard. This is a huge faux pas, and usually, a result of not putting in the time to plan, nurture, and properly communicate a company’s culture. Take time to hold brainstorming sessions with your managers and team leaders. Learn what they value most in the company’s culture, and build on it. This will temper expectations and makes alignment with future employees much easier. Take this process a step further and build out your future roles, responsibilities, and tasks in your company culture. What type of individuals do you need in leadership positions to make your vision come to life? Proper planning, strategy, and execution will help you attract the right candidate, for the right job. Think big! Cast a wide net. While some jobs do require local candidates (like police and firefighters), most jobs these days do not. Think beyond the typical cast of candidates you would normally consider and get creative on how you can fill the role non-traditionally. Doing this will allow you to diversify your pool of candidates for the position. Having more choices is always better. Right? Moreover, opening the door to a variety of candidates will ultimately help you to diversify your staff with a wider range of skills, experience, and points of view. A huge mistake is not having a diverse slate of candidates, according to Paul Wolfe, senior vice president of human resources at Indeed. The more you diversify your workforce, the better odds you have at attracting different types of people who wouldn’t normally apply for positions at your company. Ever heard of word of mouth advertising? Yup, same idea. “Don’t look for someone exactly like you or the rest of your team — you shouldn’t be afraid to bring in someone who will challenge you; an outside perspective is what can help move the needle in your company,” Wolfe says. Nobody looks in the local newspaper for a job anymore. Posting on Craigslist may return some interesting results, but ultimately is not where you want to be either. Look beyond what used to work and think outside the box. ● Your Website – Although posting on the jobs page of your website is useful to point job prospects to, it shouldn’t be the cornerstone of any search. ● Social Media – Use other sites like Facebook, Twitter, and LinkedIn to drive traffic to your job listing. ● Job Sites – Using a resume feeding system such as ZipRecruiter to broaden your options for a specific opening, or for a high volume when hiring in groups. ● Recruiters – Use professional recruiters to find the talent for you. Agencies such as Robert Half specialize in professional, white collar candidates whom they have working relationships with. Getting serious about your hunt for talent will pay off in the end. There’s a reason they say good help is hard to find! 3. Not Properly Defining the Roles and Responsibilities You’re Hiring For Another misstep business owners make is failing to define the role. They hold interviews and onboard employees, only to leave them destined for failure. There are two reasons why this is an organizational death knell. First, this is a recipe for disaster for your company. You are hiring this new person to improve efficiency, but now you have to waste valuable time on training and onboarding. Secondly, it puts your new hire in a difficult position. How are they going to know good from bad, wrong from right, success from error without the proper metrics? They will eventually become discouraged and uninspired –ultimately leading to disengagement, damaging company culture. Don’t make the mistake of simply hiring someone to help “alleviate some of your workload.” This, and equally vague job descriptions are a recipe for disaster. Defining the role you’re hiring for and putting processes in place to train and set new employees up for success are fundamental parts of building a successful business. If you can’t do this with a company of 10, how are you going to scale to a company of 1,000? Smart business owners are recruiting for their company day in and day out. It is essential to create a healthy pipeline of candidates via active networking. That means organizing lunch with colleagues, a mastermind group, and industry events. Get out there and be seen! Don’t try to do it all yourself either. Think about strategically using specialized recruiters to find top-notch candidates and keep a pace of market and salary trends. Make recruiting a company-wide practice by offering referral incentives. Did you know that 70-80% of all job listings are never made public? Instead, they’re filled through word-of-mouth or networking. It only makes sense that the talented people working for you surround themselves with other talented individuals. Don’t be fooled by the five-star resume. All that proves is that the applicant is skilled at writing resumes, or has mastered the art of matching keywords in their resume to those in the job description. Understand that the ideal job candidate possess the perfect blend of technical and soft skills, will fit well with the company culture, and should be motivated to maintain an upward trajectory on their career path. These traits are not easily conveyed on a CV or resume. Personal interaction is required early on in the hiring process to determine which candidates are truly promising and which simply know how to present themselves well on paper. Personality tests have been growing in popularity amongst companies large and small. Many companies use tests such as 16Personalities, Kolbe Index or the CliftonStrengths to determine if a candidate will fit well with company culture. When building a team, it takes many types of personalities to make it work. Analyzing a candidate’s underlying traits is an excellent way to ensure that a potential applicant is the best person for your team. When you need to get a message to someone on the other side of the country are you running to the nearest telegraph office? Do you have the operator punch through your call? Of course not. Thanks to technology we have better ways of communicating with people. You’d be silly not to use them. The same concept applies to screening candidates. Taking the time to sort through hundreds of resumes is positively prehistoric. Don’t waste your time by printing every email. Since you’ve taken the time to put together a stellar job description you should know what the position will require. The next step should be sifting through the top candidates. Utilizing an ATS (Applicant Tracking System) is a time-saving, efficient method for managing resumes. It will cast a wide net to bring in applicants, by driving traffic directly to your listing. You can avoid the time-consuming tasks of reading over irrelevant resumes. Instead, you’re moving directly to scheduling phone and in-person interviews. Not just smart –cost-effective, and easier on your back, too. On the other side of the coin, one must be careful not to be lulled into a false sense of security. Yes, technology can do that as well. I’m sure you have heard about people that followed their GPS right into the ocean. Keep your car dry, don’t be that person! Technology is a great tool for posting ads. It may take a few weeks for these ads to bear fruit. Then there’s the time it takes to sort through and review the resumes received. Smart recruiting is both an art and a science; it’s high-tech and high-touch. Posting jobs online or using data analytics to better understand trends about your target candidate pool is smart. But so is using staffing experts, who can leverage their extensive networks and industry knowledge to quickly find professionals who will truly excel in their role. Some employers see talent as a commodity. They say, “If I make a mistake, I’ll just hire someone else.” But the reality is it’s a little tougher than that. 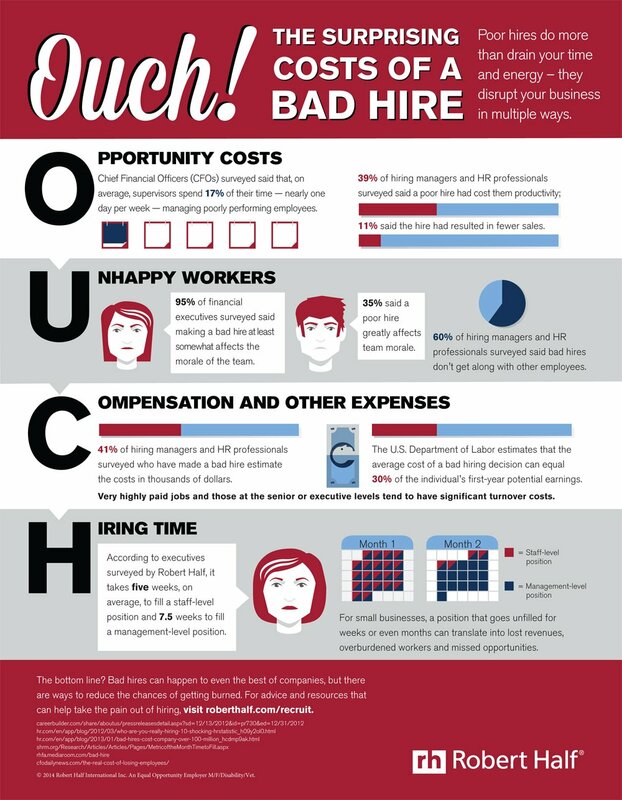 Hiring mistakes cost money. Period. In fact, the U.S. Department of Labor estimates that a bad hiring decision can cost as much as 30 percent of an employee’s annual salary, so it’s tremendously important to get this right the first time. Aside from monetary concerns, excessive job churn can contribute to a decline in team morale. There can be a significant ripple effect when you hire the wrong employee. It is estimated that the time spent coaching underperforming employees can take up a quarter of your workweek. That is a huge chunk of time that you or your managers do not have. You should be busy growing the company! So you’ve found your next rockstar. Their resume is amazing, their interview blew your socks off, and they look like they are going places! Everyone at the company is excited for them to start, the welcome party is being set-up as we speak. But hold on a minute –is there any proof to back up who they say they are? Some people are so skills at interviewing, you have to ask if they got so good at it by doing it so often! Then there are those who may not excel at the interview, but who have the skills to perform the job. When you spend all the time searching for the candidate, why not go that extra step and verify. It could save you a ton of time and money in the long run. Checking references – every single one –is necessary to make the best choice possible. Another common mistake –is creating a full-time, in-house role for tasks that are intermittent or part-time. For tasks that are intermittent, or things that may only require specialized services infrequently, enlisting the help of a VA (virtual assistant) may be your best bet. Enlisting the help of a VA offers a few distinct benefits over hiring in-house. First, if the work that you’re outsourcing is sporadic, hiring a VA means that won’t have to worry about keeping your in-house employee busy all the time, instead, you can outsource your tasks on an as-needed basis. Secondly, unless having a physical location is a business requirement, hiring virtually is a great way to save money –allowing you to forgo the costs that are involved with having a physical location and a team on-site. Having someone on your team that you can delegate specific tasks to save valuable time and energy on activities not contributing to the growth of your business. Using a VA allows you to build a scalable business scalable business that continues to grow, even when you’re not working. There are typically two types of virtual assistants you could use –General and Specialized. • A General VA: A General VA is the most common type. This is someone who takes on daily tasks and processes important for your day-to-day business operations. Tasks that are ideal for General VAs are usually technical and repetitive. Think of things such as managing emails or travel schedule, scheduling appointments, data entry, research, scheduling posts on social media, and so on. such as customer service, bookkeeping, video editing, and project management are all ideal tasks a Specialized VA.
All too often when hiring, companies bring new hires on board without a trial period. This is a mistake, since without having a trial period; you have no way of knowing exactly how your new employee is going to work. Too many people hire someone, realize that they won’t work out, but keep them on just to fill spaces and put bodies in place. Consider trialing your new hires –to ensure they’re a good fit. Hiring and onboarding new employees is much more than simply posting an ad on a job board and waiting for the resumes to come flowing in. As a business owner and entrepreneur, you need to put the same amount of care and thought into hiring, as you did in building your business in the first place. Remember, each person working for you is essentially an extension of the business. Take time to think about the type of image you want to convey to your customers and to the general public. Carefully tailor your company culture as you would your brand, because in the end, they are one and the same. Your employees should be a reflection of that –so hire wisely! Are you thinking of hiring a new team member? See what you need to know about Managing a Remote Workforce. Get our "11 Big Mistakes Business Owners Make When Hiring New Employees - Worksheet" delivered right to your inbox.